G. Duffy, Rzhanov, Y., Rinde, E., Horvei, B., and Brown, C., “Development of Acoustic Colour Technique Using Multi-Frequency Swath Acoustic Backscatter”, Underwater Acoustics. Rhodes, Greece, 2014. A. S. M. Vanderlaan, Jech, M., Weber, T. C., Rzhanov, Y., and Lutcavage, M. E., “Direct Assessment of Juvenile Atlantic Bluefin Tuna: Integrating Sonar and Aerial Results in Support of Fishery-Incident Surveys”, International Commission for the Conservation of Atlantic Tunas. Olhão, Portugal, 2014. 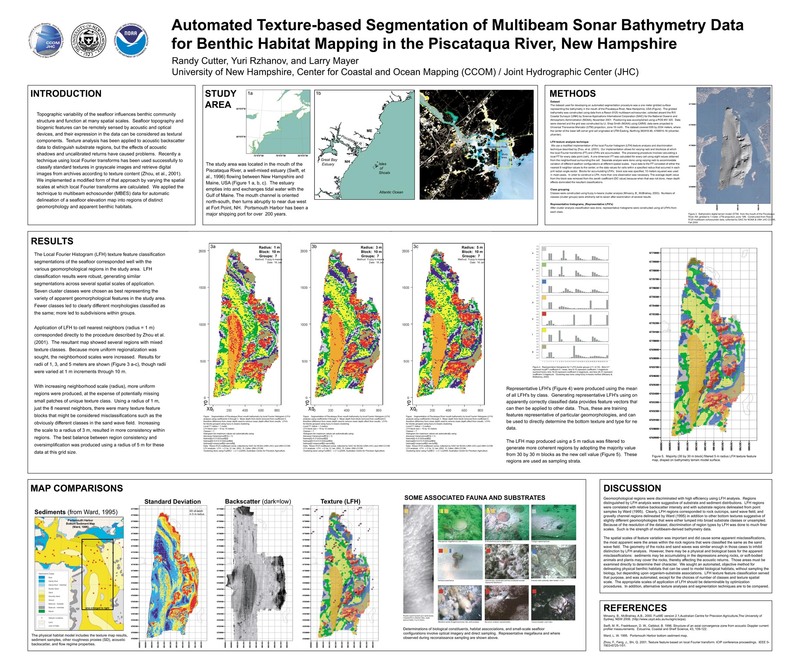 H. Hu, Rzhanov, Y., and Boyen, T., “Euclidean reconstruction of natural underwater scenes”, American Society for Photogrammetry and Remote Sensing (ASPRS) 2014. Louisville, KY, 2014. F. Eren, Pe'eri, S., Thein, M. - W., Rzhanov, Y., Celikkol, B., and Swift, R., “Evaluation of Detector Array Designs for Optical Communication Between Unmanned Underwater Vehicle”, SPIE 2014. 2014. Y. Rzhanov, Eren, F., Pe'eri, S., and Thein, M. - W., “An image processing approach for determining of relative pose of unmanned underwater vehicles”, Oceans'14 MTS/IEEE. Taipei, Taiwan, 2014. Thomas Dahlgren, Schläppy, M. - L., Shashkov, A., Andersson, M., Rzhanov, Y., Fer, I., and Heggøy, E., “Assessing impact from wind farms at subtidal, exposed marine areas”, in Marine Renewable Energy and Environmental Interactions, Springer, 2013. 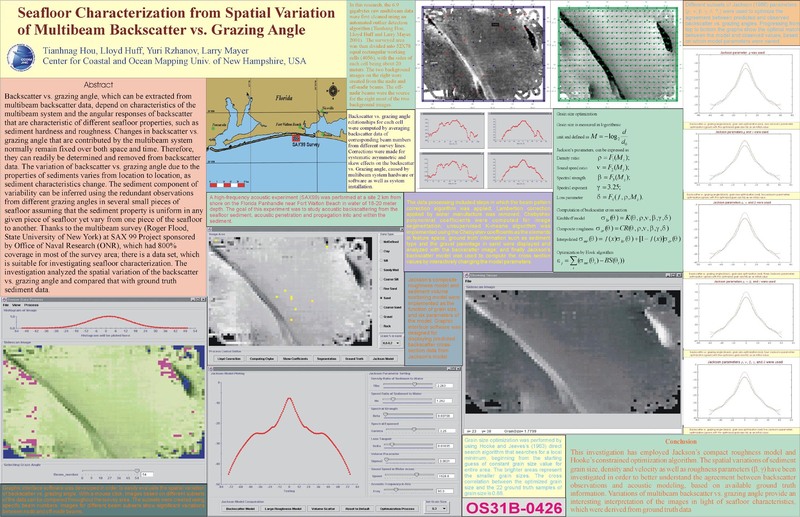 A. Shashkov, Dahlgren, Thomas, Schläppy, M. - L., and Rzhanov, Y., “Comparing manual and computer-assisted benthic cover estimations from underwater imagery for offshore wind farms impact assessment”, WinMon.BE 2013. Brussels, Belgium, 2013. A. Šaškov, Dahlgren, Thomas, Schläppy, M. - L., and Rzhanov, Y., “Application of color based semi-automatic computer analysis for underwater videomosaics: North Atlantic hard bottom case”, MAREANO Workshop. Trondheim, Norway, 2012. S. Claesson and Rzhanov, Y., “High-resolution Videomosaic of an Underwater Loss Incident”, Internal JPAC Conference. 2012. E. Fakiris, Rzhanov, Y., and Zoura, D., “On Importance of Acoustic Backscatter Corrections for Texture-based Seafloor Characterization”, ECUA'12. Edinburgh, UK, 2012. Y. Rzhanov and Pe'eri, S., “Mosaic tools for lidar surveying”, Joint Airborne LIDAR Bathymetry Technical Center of Expertise Coastal Mapping and Charting Workshop (JALBTCX). Seattle, WA, USA, 2007. 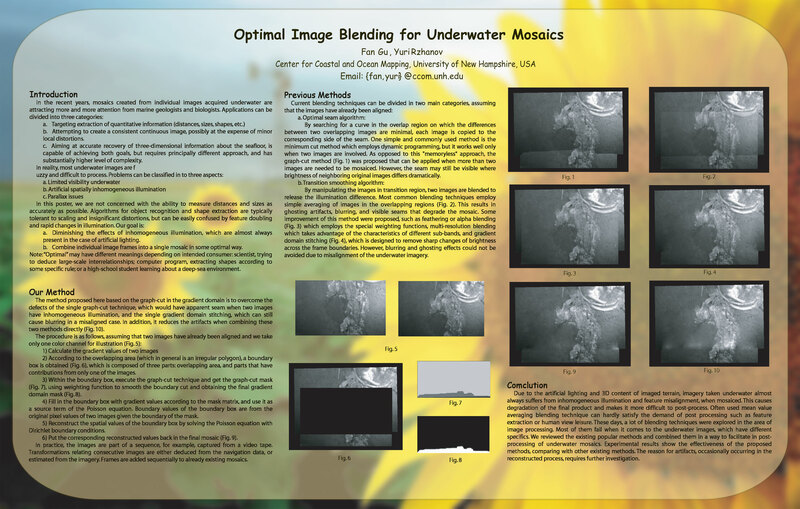 F. Gu and Rzhanov, Y., “Optical Image Blending for Underwater Mosaics”, IEEE Oceans. Boston, MA, USA, 2006. Y. Rzhanov and Gu, F., “Multi resolution quality improvement for patch-bases texture synthesis in wavelet domain”, International Association of Science and Technology for Development (IASTED). Honolulu, HI, USA, 2006. S. Pe'eri and Rzhanov, Y., “Mosaicing Tool for Aerial Imagery from a Lidar Bathymetry Survey”, International Hydrographic Review, vol. 9. Geomatics Information & Trading Center - GITC, Lemmers, Amsterdam, The Netherlands, pp. 35-44, 2006.